Why not try TriBlogs? It’s FREE! At Bike Science we’re always on the lookout for great tools to help triathletes and cyclists get faster. So when a free one comes along that can help athletes of any level, we’re all for it! Keeping a record of your training will help you to track your own improvements, keep you motivated and stop you over training! You can use your ‘public blog’ to share information about your training or use the forum to ask questions or share ideas with other triathletes. There is also a premium service for a small subscription (less than £2 a month) which entitles you to even more features, including a Garmin plugin, iCalendar sync, unlimited storage for charts, kit items and fitness tests, and an option to generate revenue from your blog using AdSense. What are you waiting for? 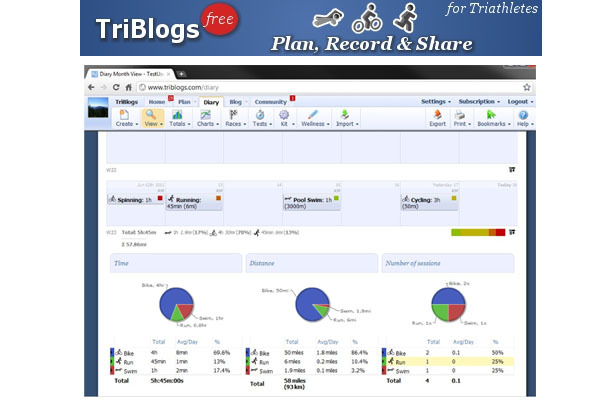 Give TriBlogs a try today! This entry was posted on Tuesday, June 28th, 2011 at 9:16 pm	and is filed under Affiliate Coaches, All Posts, Products. You can follow any responses to this entry through the RSS 2.0 feed. Both comments and pings are currently closed. Great online tool have been using it for a couple of years and it keeps getting better. It saves leaving your note book at home or having all your records stuck on the computer.